It has been particularly rainy here in Florida over the past week or so. I'm convinced that I brought it back from home with me. On my last day home, we went to my little brother's flag football game, where the rain was coming down sideways, and the temperature neared freezing. All in all, though, I love going to his flag football games. There's something amusing about watching seven year-olds running back and forth down the football field, the overly-enthusiastic parents' yelling, and the excited look that my little brother gives me right before the play's about to start. The rain is okay with me, but only because it reminds me of spending time with my family that day. I obviously picked the wrong week to go home because my family keeps bragging about how beautiful the weather has been all this week. They deserve it though, they've made it through the long, cold winter, and, believe me, that is a pretty tough thing to do. Anyways, I'm sitting out here, on my patio, in the rain, with my squirrel and duck friends. It's cloudy and grey, but I'm a little thankful for the excuse to not feel obligated to be at the beach or the pool (though the beach sounds pretty awesome right about now). 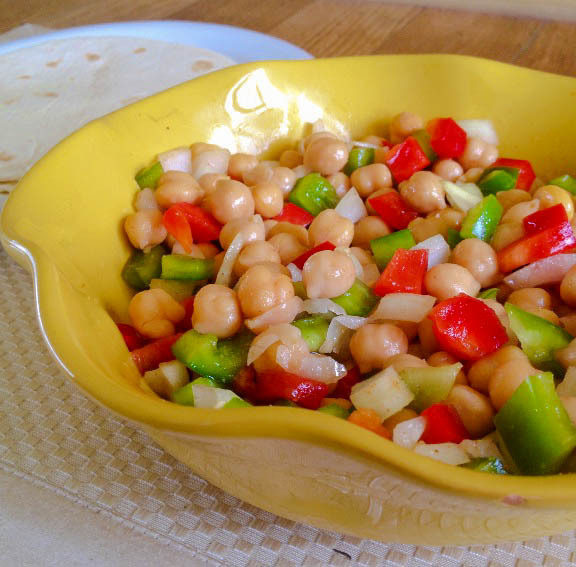 Yesterday was a much nicer day, and I made this summery chickpea salad. It's so easy to make, and you can easily double it. The lemon and lime go so well with this dish. Cilantro would also be a nice addition, though I forgot to use it. Fortunately, the outlook for the week ahead is sunny and hot, and it better be because I graduate from law school next weekend! I'm pretty sure that I deserve a pool day with lots of piña coladas and sun. Add all of the ingredients to a large bowl. Toss to coat, adding more salt/vinegar/seasonings to taste. Serve wrapped in flour tortillas (optional). I love peppers, they add great color and flavor to dishes. Beautiful photo! Congratulations on being so close to your graduation!! That is so exciting :) I'm glad you made it home briefly too - I'm sure your brother loved having you at the game. Thanks Kari! :) It was definitely nice to be home. One of my best friends got married! (...So that was obviously super exciting and fun). Maybe this salad and all of it's fresh flavor will bring the sun back!